Answering the question “What to do and what to say” with the goal of encouraging safer encounters between citizens and police was the impetus for this digital experience. Conceived by The RANE Institute, this app is a non-profit source for information in advance of potential police encounters and events. The result is a collaborative effort of the RANE Institute, Citizen’s Crime Commission, The Justice Department, FBI, Red Cross, and many others. Hands All Together is a true platform / screen agnostic experience. Its design transitions seamlessly from web to mobile, tablet to native app. 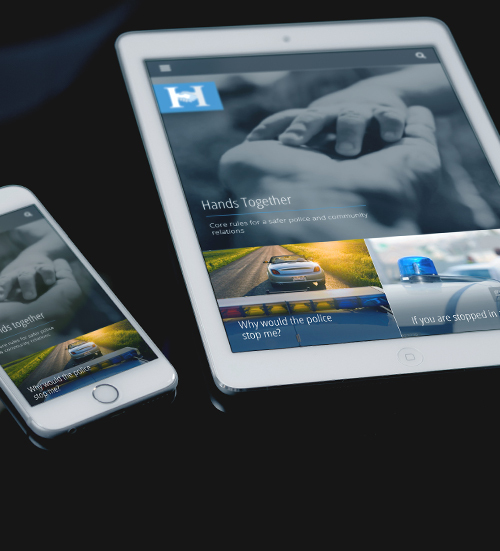 Hands All Together is both a responsive web experience with companion native mobile apps, which provide information and guidance through a series of articles aimed at both citizens and police. All the parties involved took this effort on, on a broadly collaborative basis, with the confidence that empathy and understanding between all sides is both desired and achievable. Taking a service oriented approach Hands All Together is able to be ported to any new screen or device with ease. The entire infrastructure is built on a custom Node.JS Content Management System with custom end points on a per screen basis. Site launch – November 2015.